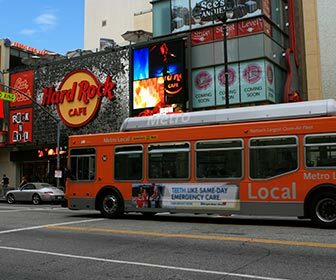 METRO (Public Buses and Trains) - Los Angeles has the second largest public transportation agency in the nation that operates more than 1,500 buses. We also have a subway system that can take you from Downtown Los Angeles to Hollywood in about 15 minutes! Los Angeles County Metropolitan Transportation Authority (Metro) operates the public buses and commuter trains within Los Angeles. The metro.net has extensive schedule information, trip planners and much more. How to use the Metro Trip Planner on Metro's website - and other tips about using Metro, such as how to pay fare, getting to some of the famous tourist attractions, identifying buses by their color and more. The Metro Trip Planner is fast and easy to use. You can use it to plan routes in advances, so you don't waste valuable vacation time. You can also use the Metro Trip Planner to find out if your hotel is near convenient Metro routes BEFORE you make your reservations! If you are going to rely on public transportation while visiting Los Angeles, then it's very helpful to become familiar with metro.net! Public Bus Agencies in Los Angeles - Try Metro (above) first. If the Metro does not serve your desired area, follow this link to find schedules, routes and info for other bus agencies within the Los Angeles area. Taxi Service Areas in Los Angeles - There are about a dozen taxi cab companies in Los Angeles, but they are limited to pick up only in their authorized areas. So you will need to call the appropriate cab company, depending on where you want to be picked up. Follow the link for details, and phone numbers of official taxi cab companies in the various areas. Shuttle Services and Limousines - Serving Hollywood, downtown L.A., major airports and other destinations in Los Angeles and Orange County. 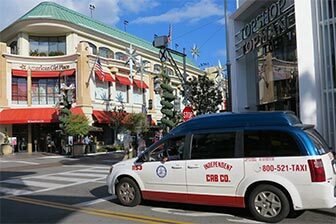 Guided Tours of Hollywood and Los Angeles - let someone else do the driving and navigating by taking a guided tour. Browse the list of tour companies on Hollywood Boulevard, as well as downtown L.A., Santa Monica and more. Some guided tours include hotel pickup and dropoff. Also, browse a list of featured guided tours that you can purchase online. L.A. Metro Rail - A network of commuter rail lines within the metropolitan basin, including service to downtown L.A., Hollywood, Universal Studios, Santa Monica, Culver City, Long Beach and other areas of Los Angeles. Amtrak - Train service between Los Angeles and most cities in the United States and Canada. The website includes routes, schedules and station information. Metrolink - A commuter rail system that links Orange County with surrounding areas including Los Angeles, Riverside, and San Bernardino Counties. Airports in Los Angeles - LAX, John Wayne, Burbank, Ontario, more. Carnival Cruise Lines - has a Port of Call in Long Beach. 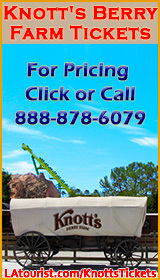 The website offers information on their cruise lines and vacations. Catalina Express - Daily boat departures to Catalina Island from San Pedro, Long Beach and Dana Point. Catalina Island Helicopter Service - Island Express Helicopter Service offers a 15 minute flight to Avalon, helicopter dinner tours and more. Bicycle Information - City of Los Angeles Department of Transportation Bicycle Information Web Site provides bicycle maps, bicycle parking tips and info, bicycle law information, and other resources. Look for a link on the lower right side of the Bicycle Information Web Site where you can download a guide which offers Rules, regulations and safety tips to help you make the most of bicycling around Los Angeles. DMV's Safety Tips for Bicyclists and Motorists - Advice from the Department of Motor Vehicles regarding riding a bicycle on the road in California, as well as links and references to motor vehicle laws (the same laws that govern automobiles also apply to bicycles). Bike Share Programs - At many locations throughout Los Angeles you will see bicycle racks with a row of bright green bikes, which are for rent by the hour (most programs prorate partial hours). You can sign up online, download a mobile app, or pay by credit card at the station. Either way, you do not have to leave your driver license at a rental shop. However, the bicycles are built to last, not for speed. They are best for short trips, or for making connections between bus stops. You must be at least 16 years old to use bike share programs, and an adult needs to be with anyone under 18. These are relatively new program that began during 2016, so the stations are currently limited in number. Metro Bike Share - use your Metro TAP card (registration required), or a credit card to rent a bicycle at a stations in downtown L.A. (coming soon to Pasadena and Port of L.A. area). Beverly Hills Bike Share - offered by the City of Beverly Hills. Breeze Bike Share - offered by the City of Santa Monica, and includes hubs at Venice Beach. West Hollywood Bike Share - offered by the City of West Hollywood. Freeway Names - The freeways in Los Angeles are often referred to by name, rather than number. On news traffic reports, and when someone gives you directions, they might refer to a freeway by its name. This link contains a list of names of freeways in Los Angeles. Read the Parking Signs - THIS IS IMPORTANT - Certain major streets in Los Angeles become No Parking zones during "rush hour" traffic (generally 7AM-9AM, and 4PM-7PM, Monday through Friday). For example, parking is not allowed on Wilshire Boulevard near Museum Row, and La Brea Avenue near Pink's Hot Dogs during those times. Getting your car towed can ruin your vacation, so the #1 driving tip in L.A. is to READ the signs! International Driving Permit (IDP) in California - An IDP is not required in California, and is only useful if it can help translate the official driver license that was issued by your local government. Follow the link to the Department of Motor Vehicle's statement on the subject, or find it at the DMV FAQ Page. Parking in L.A. by the LADOT -Public parking lots in Los Angeles, by the L.A. Department of Transportation. The website is integrated with Google Maps, although it only shows public parking facilities. In any given area there are also many private lots, and near train stations there are facilities operated by Metro. So this list only a small percentage of parking that is available. Parking Map by Best Parking - an interactive map that displays parking lots and rates in selected locations of Los Angeles, including most of the tourist areas.